Medical emergencies can happen at any time – even during a natural disaster. It's something Red Cross volunteers Doug Winter and Gerard Moore found out first hand on the West Coast. The team mucks in as they respond to flooding in Franz Josef. 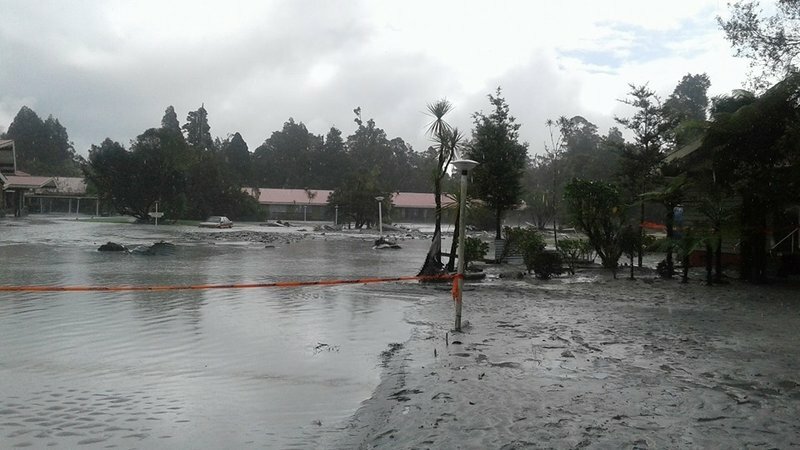 When heavy rain caused extensive flooding in Franz Josef this year, Red Cross' Christchurch Disaster Welfare and Support Team (DWST) drove through the night to help the remote West Coast community. Deputy team leaders Doug and Gerard were at the forefront of the response as the team helped their Greymouth counterparts run the evacuation centre. When the volunteers took time out to grab tea, Doug and Gerard offered to stay behind and manage the centre. That's when the second emergency started. "A man from the shop next door came racing in, saying 'help, help, a man's collapsed and he's dying'," Doug says. Doug and Gerard wasted no time. Gerard went on ahead to assess the situation, while Doug grabbed the team's oxygen and resuscitation kit. Next door, the situation was serious. It looked as though the collapsed man had suffered a stroke. "He was grey and making a terrible sound, unconscious," Doug remembers. "He was in a bad shape." Gerard and Doug knew they had to start resuscitation immediately – a two-person job. They began to administer oxygen, and when the man started showing signs of consciousness, the pair manoeuvred him upright, holding him up and ensuring his airways were kept open. With the ambulance twenty minutes away, it was vital they did everything they could to keep the man alive. Red Cross' DWST training helped, Doug says. "The training just kicks in and surprisingly you just stay really, really calm and just do your job." Red Cross' DWST members drove through the night to help the Franz Josef community, as water flooded through the township. New Zealand Red Cross. In the meantime, the rest of the team had arrived back with the food. Doug received a text message from one of the other volunteers, letting him know their tea was waiting for them at the evacuation centre. "I quickly text back, one-handed – 'saving a life'. And he text 'hurry up, it's getting cold'. "It was just a bit of humour and sometimes that helps in these situations." By the time the ambulance arrived, the man had regained consciousness. Although he hadn't fully recovered, it was clear the quick actions of Gerard and Doug had saved his life. "You just do it without thinking," Doug says. If you're interested in saving lives, helping during emergencies and learning new skills, join your local Disaster and Welfare Support Team. There are 18 teams across New Zealand, ready to respond whenever an emergency happens.